Many Vietnamese seafood exporters are facing bankruptcy due to the serious shortage of fresh seafood resulting from unfair competition from China. At a recent conference in Ho Chi Minh City, Nguyen Thi Thu Sac, Deputy Chairperson of the Vietnam Association of Seafood Exporters & Producers (VASEP), said Chinese ships have illegally prevented Vietnamese ships from fishing in Vietnamese territory. She went on to say that at the same time, Chinese wholesalers have try to buy up most of the seafood, caught by Vietnamese fishermen, either at ports or even at sea, before the catch could make its way to Vietnamese companies. At the conference, representatives from Vietnamese seafood firms strongly opposed what they considered unfair competition, saying that while they have to pay taxes Chinese buyers avoid this by buying directly at ports or at sea. The total value of this type of illegal trade cannot be accurately quantified, but does add to unbalanced bilateral trade, said Pham Xuan Nam, Director of Dai Thuan Joint Stock Company in Khanh Hoa Province. Nam added that local firms have to pay more than Chinese traders for the same products, but still cannot secure enough to meet their production demands. His company can only ensure enough fresh seafood to meet about 30% of their processing capacity. According to Sac, due to the serious lack of supply and rising costs 147 Vietnamese companies have halted seafood processing and exports so far this year. Chinese traders have bought Vietnamese seafood for many years, but local fishermen, enterprises and authorities have not done enough to discourage unfair trade practices, Nam said. “They buy the materials, have them semi-processed and then take them over the border, as if they were caught and processed in China,” Nam said. 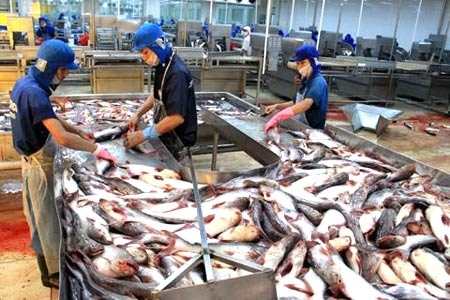 Nguyen Diem, Director of Da Nang Processing Import Export Trading Company (Procimex), said the Minisitry of Agriculture and Rural Development should consider imposing taxes on local fishermen who sell seafood to foreign traders. Sac highlighted the fact that Indonesia has applied a ban on importing domestic seafood, adding that Vietnam should consider doing the same to ensure a sufficient supply for domestic companies.